This creature is dead and is being eaten by fungus in Raccoon Mountain Caverns. This is a common occurrence in caves when spiders die. I thought its just interesting feel free to Frass since its dead, or do whatever. It might be a harvestmen. 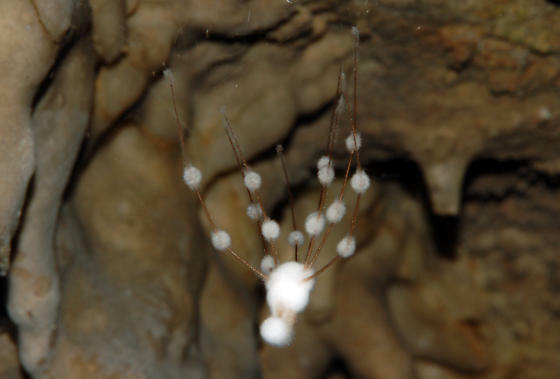 I have seen what I am pretty sure is Pholcus in the same cave. They don't go in usually more then maybe 100 feet back into the cave. This particular cave is a "show cave" so that may explane it - they are usually around the lights in the cave. Cokendolpher, James C. “Pathogens and parasites of Opiliones (Arthropoda: Arachnida).” The Journal of Arachnology 21, no. 2 (1993): 120-146.